Crazy Beautiful You is a 2015 Filipino teen romantic comedy-drama film directed by Mae Cruz-Alviar starring Kathryn Bernardo and Daniel Padilla. It was released on February 25, 2015 in theatres nationwide. The film earned five million on its opening hour, raking in a total of ₱38M first-day gross, one of the highest single-day gross in Philippine history. It also had the highest number of private & fanclub block screenings with 88+ and that excludes later block screenings sponsored by celebrities such as Kris Aquino and Vice Ganda – it has reportedly earned close to ₱420 million in its entire theatrical run. As of March 8, 2015, two weeks since it was released the movie already earned ₱220 million in local box office, and it is only the second movie after Starting Over Again to breach the $2 million mark from international screenings. The film was continued to be shown abroad until June 2015. It was screened for the first time in Asia’s top academic institution by the CEDARS SERVICE 100 Domestic Workers Empowerment Project (DWEP) as part of its Inter-cultural Integration program. As a highlight of the screening, member international students facilitated an interactive discussion headed by Dr. Michael Manio, Chi Ian Tang (from Macau), Masaaki Onitsuka (from Japan) and their international students from the University of Hong Kong from (Germany, Belarus, Macau, Hong Kong, China, Bulgaria, Chile, Japan, Slovakia, Norway, USA, Canada, India, Ghana and Philippines). The movie also featured Filipino traditions and famed spots which inspired the members to conduct a sharing of what makes each country unique, plus interactive games, all as part of the cultural integration and exchange program. Because of the inspiration and fruitful exchange brought by the movie, the DWEP clamored for additional screenings the same day to accommodate the number of people from OFWs to students, who patiently waited to see the film. “Crazy, Beautiful You” was organized by SERVICE 100 DWEP in partnership with the Philippine Consulate General to empower Domestic workers in Hong Kong and students at the university. The film screening was also made possible by The Filipino Channel. Sometimes, though we don’t expect to find love, it’s the one that finds us. In “Crazy Beautiful You,” we are introduced to Jackie, whose rebellious spirit forces her mother to take her in a medical mission in Tarlac in hopes that she’d turn for the better. There, Jackie meets a jolly lad named Kiko, who will make sure she gets all her tasks done. In the middle of his mission, he and Jackie will discover something crazy… and beautiful. There is some maturity to the two leads’ performances that proves that there is an actual reason for their extreme popularity. Their pretty faces and celluloid love affairs are actually backed up by a sliver of understanding of what their characters are going through, no matter how simplistic those conflicts and dilemmas may be. Kathryn Bernardo and Daniel Padilla continue to be a fine match. Bernardo doesn’t have nearly enough material to work with, but she elevates everything that she’s given. And it’s nice to see Padilla growing out of the contrived brooding persona of his earlier films. It turns out that Padilla is the second coming of his uncle, projecting a goofy charisma that is clearly a more comfortable fit. This vehicle definitely is a Kathryn Bernardo acting piece. Admittedly, the story spends more screen time with Jackie, with her dilemma front and center. She delivers a heartwarming performance, highlighted with a big confrontation scene between Jackie and her mom, portrayed by Lorna Tolentino. In that highly charged scene, Bernardo managed to hold her own against the veteran actress. Daniel Padilla is getting there. He was able to dig into Kiko’s layers as comic, brooding, romantic and conflicted. You have to admit, the guy is funny in his initial scenes. He churns an okay performance yet you see promise there. This is definitely one of his best outings to date. The risk to do away with pretty Kathryn’s usually tweetums and saccharine projection pays off, and her work here provides ample proof that her open-minded approach bodes well for her future as a committed actress. Surprisingly, Daniel does even better, because the role fits him to a T—he doesn’t have to “create” a character he isn’t familiar with. In fact, the film ends up showcasing Padilla’s sensitive side, especially in his unforced but heartfelt confrontations with his distant father (Gabby Concepcion), half-brother (Pascual, who’s no slouch at acting) and negligent mother (Assunta de Rossi, who looks too youthful for the role). He conveys his bottled-up yearning for his parents’ love and affection with affecting clarity. A closer look at Crazy Beautiful You in this "Take One" feature. Story Conference of the much-awaited romance movie of the phenomenal loveteam, KathNiel with Ms. Lorna Tolentino and Mr. Gabby Concepcion. KathNiel to have a kissing scene in Crazy Beautiful You? 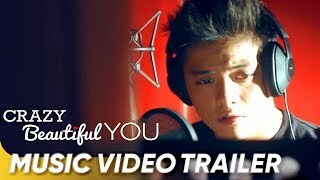 Music video trailer for "Crazy Beautiful You," featuring the official theme song, "Nothing's Gonna Stop Us Now," recorded by Daniel Padilla and Morrisette.